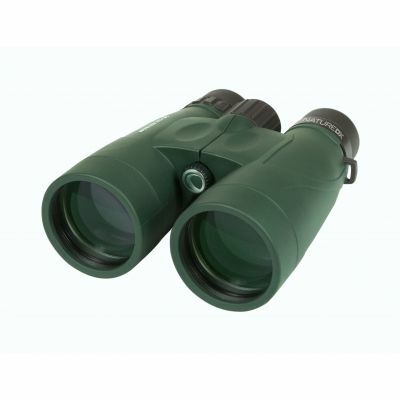 Celestron’s Nature DX 10x56 binoculars are the perfect companion for your next all-day outdoor adventure. With phase-coated BaK-4 prisms and fully multi-coated optics, Nature DX reveals image detail you won’t find with other entry-level binoculars. A great first step into the world of serious, large-aperture sport optics, the views through Celestron’s 56 mm Nature DX models rival those of more expensive binoculars, at a price to fit your budget. With large, 56 mm objective lenses, you’ll notice the increased light-gathering abilities of Nature DX 10x56. Enjoy extra time viewing wildlife at dawn and dusk, when it’s too dim to use smaller binoculars. The 10x56 model provides enough magnification for long-range sighting by day and casual astronomical observing around the campfire. Plus, they’re tripod adaptable to ensure stability during extended viewing sessions. Sturdy, twist-up eyecups with multiple stops. Eyeglass friendly with 18.2 mm of eye relief.